Lesly had been working as a Global Mission pioneer for only a month in the capital city of Gaborone, but he was already making an impact for Jesus. I joined him for a few hours to film his ministry in action. For inspiring stories about Global Mission pioneers and church planters around the world, watch Mission 360° TV at AdventistMission.org/videos. I’d never been to Botswana, so I didn’t know what to expect when I disembarked the plane after my 17-plus-hour flight. What I noticed immediately was that almost everyone greeted me with a radiant, warm smile. It was a pleasure to be in this friendly country in southern Africa! One of the people I met in Botswana was a Global Mission pioneer named Lesly. A pioneer is someone who works in an area or among a people group where there’s no Adventist presence in order to start a new congregation. Lesly had been working for only a month in the capital city of Gaborone, but he was already making an impact for Jesus. I joined him for a few hours to film his ministry in action. As we walked the city streets, I asked Lesly about the challenges and rewards of being a pioneer and what he’s doing to share the gospel in his new community. “When I first arrived, I had mixed feelings about coming to this area because it’s known for it’s alcohol and substance abuse,” Lesly said. “I wondered how I’d ever make a difference here for Jesus. “I was happy to learn that the people have a real thirst for God’s Word. But I also realized that they’ve had really tough lives and are looking for someone who can help them in their daily struggles. “One day, I brought a loaf of bread and some juice to a family. It wasn’t much, but when they saw that I genuinely cared, they were open to hearing about Jesus. “They asked me, ‘Are you sure that what you’re teaching is Christianity? Because we’ve believed that all Christians care about is whether or not we go to church.’ When people see that we’re interested in all of their needs, they get encouraged and marvel at this being branded as the gospel of Christ. Lesly is working with local leaders to improve this community and meet the needs of the people. He has spent a lot of time volunteering at a local day care, reading stories to the children and even praying with them. 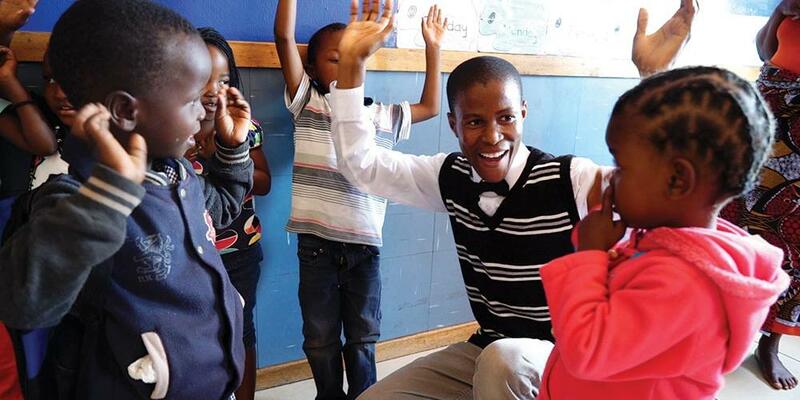 His goal is to improve the day care’s condition and help the children in any way that he can. I was impressed with Lesly and his ministry. He talks with the people in his community, visits them in their homes, eats meals with them, finds out what they need, and fulfills those needs. He’s living out Christ’s method of ministry, shattering the people’s perception of Christianity and rebuilding it in the image of Jesus. Please pray for Lesly and our other pioneers around the world as they seek to share Jesus in challenging conditions. To learn more about their unique ministry, please visit global-mission.org. To watch the video “A Pioneer’s Life for Me,” please visit Mission360Mag.org and select 4th Quarter 2015 from the dropdown window.